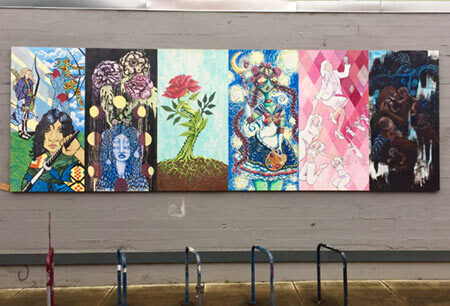 From the sidewalk, the mural Six Strong invites the viewer into the Alberta Co-op parking lot to take a closer look at the six diverse vibrant panels installed by local artists in 2016. Michelle McCausey led the Alberta Art Works project. She and five other artists were given 4×8-foot panels to paint their vivid stories reflecting female empowerment. The result is an impressive, rich, eclectic tapestry with each artist’s own unique style. “I think the piece as a whole – along with my original intention of creating opportunity for and supporting female artists – is a message of talent, strength, encouragement and presence,” Michelle reported. “I hope the mural inspires our community to support their female artists. I also hope young women and girls see these paintings and realize they, too, have opportunity and support,” she pointed out. Rob is an Oregonian who worked in web marketing for years. Now he’s involved in drone aerial photography – when he’s not on his bike.